CHICAGO, Jan. 9, 2015 /PRNewswire/ -- United Airlines today announced the start of a special bonus-miles promotion, enabling MileagePlus members to significantly boost the award miles they earn for choosing to fly the airline's premium cabins. Beginning today and for travel completed through Feb. 28, members may earn up to 12,000 bonus award miles per flight segment, in addition to base earnings and other bonus miles they typically earn. Long-haul flights include those of at least 3,000 miles and United's p.s. Premium Service between New York JFK and Los Angeles and between New York JFK and San Francisco. Customers who purchase premium-cabin tickets for United and United Express-operated flights and United-marketed flights operated by partners Air Canada, ANA, Austrian, Brussels Airlines, Copa, Lufthansa and Swiss may take advantage of the promotion. "With this offer, we are pleased to begin the New Year by further rewarding our premium-cabin customers for their loyalty and their value," said Praveen Sharma, United's vice president of loyalty. Members do not have to register for the promotion; United will add the bonus miles to their MileagePlus accounts after they have completed a qualifying flight. For more information, visit www.united.com/newyearbonus. 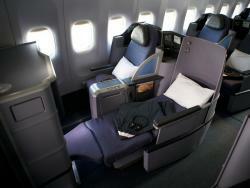 United continues to make significant investments in its premium-cabin service. United is the only U.S. airline to offer premium-cabin flat-bed seats on every long-haul international flight to and from the continental United States. The carrier's premium-cabin customers may also enjoy seatback, personal on-demand entertainment on long-haul international and p.s. flights, multi-course meals and premium beverage options, including sparkling wine and Goose Island's 312 Urban Wheat Ale craft beer. Also, this year United will further enhance its meal and beverage service, including expanding premium-cabin meals within North America to flights of at least 800 miles, or more than two hours and 20 minutes. United Airlines and United Express operate an average of 5,055 flights a day to 373 airports across six continents. In 2014, United and United Express operated nearly two million flights carrying 138 million customers. United is proud to have the world's most comprehensive route network, including U.S. mainland hubs in Chicago, Denver, Houston, Los Angeles, New York/Newark, San Francisco and Washington, D.C. United operates more than 700 mainline aircraft, and this year, the airline anticipates taking delivery of 34 new Boeing aircraft, including the 787-9 and the 737-900ER. United is also welcoming 50 new Embraer 175 aircraft to United Express. The airline is a founding member of Star Alliance, which provides service to 193 countries via 27 member airlines. More than 85,000 United employees reside in every U.S. state and in countries around the world. For more information, visit united.com, follow @United on Twitter or connect on Facebook. The common stock of United's parent, United Continental Holdings, Inc., is traded on the NYSE under the symbol UAL.